Mt Warning - Wollumbin - to give it its local Aboriginal name. Around one hundred thousand people climb Wollumbin or Mount Warning every year. What is it about this mountain that inspires so many to climb it ? It is an 8 km round trip of which half of that journey is uphill. It's a great place to go bushwalking. The Mt Warning bushwalk starts off with you quickly being engulfed by the rainforest that forms much of the scenery on the journey up the summit. The nature of the forest changes as you climb higher. The track is like many bush tracks in popular national parks. It is well worn and scattered with rocks and with the occasional tree root. There are steps, stairs, pathways and handrails in more difficult spots to help make your journey up Mt Warning easier. In fact, up until the last few hundred metres, the whole journey is relatively easy.The last 200 metres or so is a steep climb with you having to help pull yourself up with chain rails that have been installed for the job. Before we ever climbed Mount Warning a friend was telling us how you had to pull yourself up the last few hundred feet. We had strange visions of us hanging off a steep cliff face like Chris Bonnington or Edmund Hillary, but it isn't quite as difficult or dramatic as that. This last leg is the biggest challenge but as long as you are reasonably fit, you will be fine. We have friends who are in their 60s climb it no bother. The view from the top of Mt Warning is well worth it. It will take your breath away..
From the summit of Mt Warning you can see the Gold Coast skyline, north to Queensland with the Glass House Mountains in the distance. To the West towards the NSW interior, you can see a vast display of mountain peaks with the Great Dividing Range in the distance. South, you can see villages, rivers dams and more mountains with the coastline drawing a line between the land and the ocean. To the east you can see the Pacific Ocean disappearing into the skies on the horizon. The Cape Byron lighthouse is far away in the distance and you can also make out Julian Rocks off Byron Bay jutting up out of the sea. There are a number of viewing platforms on the summit, making it safer for visitors and protecting the landscape from all the human traffic. It is so peaceful at the top but you find yourself trying to imagine what it was like when the now dormant volcano spewed it's lava and rocks 100 km in all directions. If you notice lots of rock walls in some of the local areas, they were built by farmers cleaning up the land and trying to find a use for all those darn rocks. Mount Warning is the centre of the volcano that stretched from Mount Tamborine in the North to Lismore in the south over 20 million - yes 20 million - years ago. It is also just a shadow of it's former self as it used to be many times higher than what it is now. The lava made the rich red volcanic soil typical to the surrounding area, and has helped make it what it is today. Wollumbin is a sacred place to many Aboriginal Communities with enormous cultural significance for members of the Bundjalung Nation. Under Bundjalung Law only certain chosen people are allowed to climb the mountain. They do ask people to consider not climbing as a sign of respect for their laws and culture, so bear that in mind while you are climbing and treat Wollumbin well. 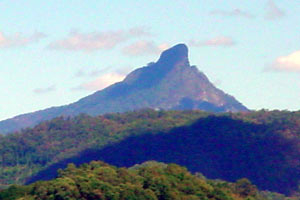 Captain James Cook gave Wollumbin the name Mount Warning in May 1770. It was a landmark to 'warn' mariners of offshore reefs that are found in the area. The area became a reserve in 1928, and in 1967 became a National Park and was World Heritage listed in 1986. There is a Wollumbin Festival every year where local communities celebrate and give thanks to their mountain. It's normally around the 1st or 2nd week of October at the Tyalgum Showground. - If you love festivals check out Festival Pig a great guide to festivals around the world. It is compiled by a group of Friends who travel a lot and gives an honest assessmant of some of the worlds top festivals. If you are wanting to climb Mount Warning, you need to think ahead and plan your trip. The Mount Warning Road is on the way to Uki, - pronounced yook-eye - which lies at the heart of the area, and it is just 10 minutes drive from Murwillumbah. It not only leads to the World Heritage listed Mount Warning National Park, but along the way there are roadside stalls selling local produce as well as the Wet Paint Gallery Cafe featuring local artists work which is available for purchase. It serves a great selection of snacks and meals. Mt Warning National Park is over an hours drive from Byron Bay. It takes a certain amount of time to do the climb so you can't set out too late in the afternoon as you really need to be back down before dark. There is signage with guidelines on the latest times you should be setting off up the mountains depending on what season it is and taking such things as daylight savings into it. You should generally give yourself 3-5 hours. 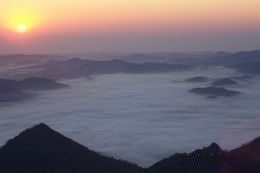 There are tours you can do with a trip to Mount Warning as a stopoff such as the Byron-Nimbin tour and you can also do a sunrise tour which gets you to the top in time to be the first on Mainland Australia to see the sun come up. But you have to be pretty keen as it can mean heading off at anywhere between 2-5 am depending on the time of year. Some even do a breakfast of sorts for you up the mountain and maybe even champagne...bit early for some of us but each to their own..You could spend a day and do the Mt Warning National Park, as well as the Nightcap and Border Ranges National Parks. That would make for a very pleasant full day driving tour. If you are not tempted to climb up to the peak, there is the Lyre Bird Walk. It is a 500m stroll from the parking area to a viewing platform looking out over the rainforest and Breakfast Creek. A very pleasant and easy bushwalk. There is an information board situated near the stairs at the start of the summit walking track. Korrumbyn Creek Picnic Area is 1.5km down the road from the start of the walking track. 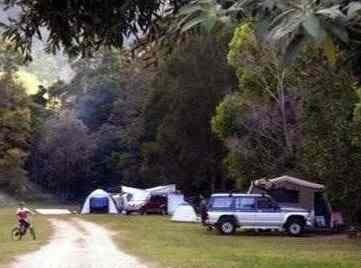 * Camping and fires are not permitted here or in any other area of the Mt Warning park. To get to the Park you can follow the signposts from the Pacific Highway going through either Murwillumbah or Uki. 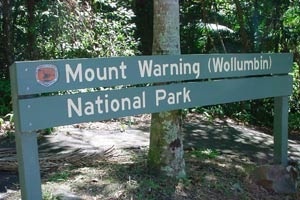 Follow the signs from the highway for either Murwillumbah or Uki, then look out for signs pointing to Mount Warning. Enjoy your bushwalk. We hope you love Mt Warning as much as we do.